I have always, and I mean ALWAYS, wanted a pair of velcro climbing shoes. I’d seen climbers at the gym with them and it seemed so convenient and efficient. But the selection of shoes at the local outdoor store was limited, and I refuse to buy shoes without trying them on first. On my prior visit to EMS for climbing shoes, when I finally landed on the La Sportiva Nago shoe, I tried on every shoe they had available. When it came to the shoes without laces, I had the same problem with every brand (available): there was too much room in the toebox when the shoe fit comfortably, and when I sized down enough to actually fill the toebox, the shoes hurt too much. When the time came to get the Nago’s resoled, I decided to head back over to EMS and pick up a second pair of shoes (Why EMS? Because I get 15% off with my Sportrock membership). The selection hadn’t changed much, except for two shoes: the Scarpa Techno and the Scarpa Force. When I first slipped the shoe on, I noticed something different – there wasn’t a lot of space above my toes in the toebox (very much unlike every La Sportiva, 5.10 and Evolv velcro shoe I tried). I sized down to a EU 41 / US 8 and I KNEW this was the shoe I would be walking out of the store with. A snug fit with no hotspots or pressure points, which was surprising seeing my toes were curled and scrunched up in the toebox. But it just felt right. That was almost a year ago, and the Scarpa Force is still my primary climbing shoe for the gym and the crag. The shoe is fully synthetic, so you don’t get the stretch that you would with a leather shoe. As a result, the fit is almost exactly the same as it was the day I purchased them, except the shoe is more molded to the shape of my feet (you can see the bumps from the knuckles of my toes in the top of the toebox – click the image to view a larger version). Perhaps my favorite aspect of this shoe is the power it allows me to place to the toebox. I can toe-in and edge on some of the smallest of features, without a lot of bend at the joints where my toes meet the ball of my foot. Picture a ballerina standing on her toes – I can do that in these shoes (although not for very long!). The support in the toebox is unsurpassed, especially for how comfortable the shoe remains. 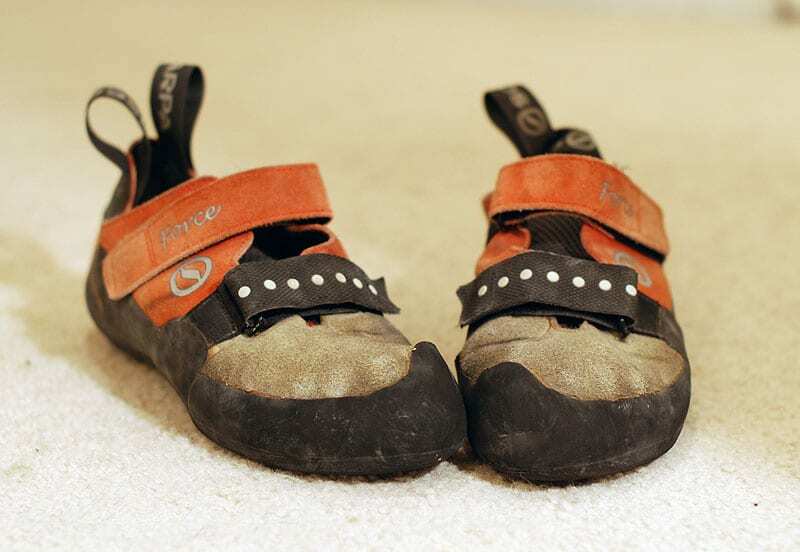 The Scarpa Force has proven a more-than-capable shoe for both route climbing and bouldering. It has served me well on V6 and V7 problems in the gym, and 5.11 and 5.12 routes both indoors and out. I have had only one complaint about this shoe. The rubber has a bad habit of pulling away from the upper material (Suede/Lorica®), as you might be able to see in the picture of my dirty shoes above. A little bit of superglue usually fixes this (and when Rock & Resole resoled them a few months ago they patched them up a bit as well). It’s not really a big deal to me, but it started happening only a few weeks after owning the shoe, which kind of surprised me. Perhaps it is a design flaw, or perhaps it is because I’m cramming my fat foot into a shoe that is probably a half or full size smaller than it should be! 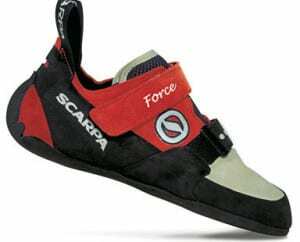 So if you’ve struggled with the fitment of other brands of climbing shoes, particularly with how much space you have in the toebox, check out the Scarpa Force sometime. You might find yourself surprised at how different, and comfortable, the fit actually is, while providing great climbing support. At $130, the Scarpa Force runs in the upper price range of climbing shoes available, but I think you’ll find them to be well-worth the investment, as you’ll have them for years to come.